Share the post "First in Flight"
Yesterday, having promised myself a free Sunday morning to do some work outside, I woke up to a light rain. Urgh! So instead of doing something I’d planned to do, I focused on getting more inside work done that I’d promised for a rainy day. I was amazed at how quickly the morning passed to where I was rushing to get my clothes changed so I could make it to my public open house on time. Looking back on what I managed to get done, I was pleased to find one less thing on my “to do” list being mentally crossed off. I planted several tomato plants much later than normal this year and they’re now getting quite large, but not even beginning to turn red. If this weather continues to be as cool as it was today, I may have to pick them and bring them inside to ripen. Looking at them today brought back memories of my grandmother and her uses for green tomatoes. Since she was a lover of any type of meat that was roasted–especially beef or pork. My public open house today at 104 – 11th St NE was quite the success to where I wasn’t alone but maybe 10 minutes the entire time. I’m glad to find buyers finally realizing what a great value it is. Where can you find a home offering 4 bedrooms, 2 full baths, a newer double garage for just over 100K? There’s absolutely no major improvements necessary. I told one couple today that anything they’d want to change in the home wouldn’t be anymore than a Saturday or Sunday project. There was one couple there whom I do hope ends up buying it because I know they’ll be the right fit for the neighborhood, and no doubt the neighbors will be glad to have them. I absolutely love working with the younger couples. Their enthusiasm is contagious and they’re always thankful for the extra miles I freely go for them. 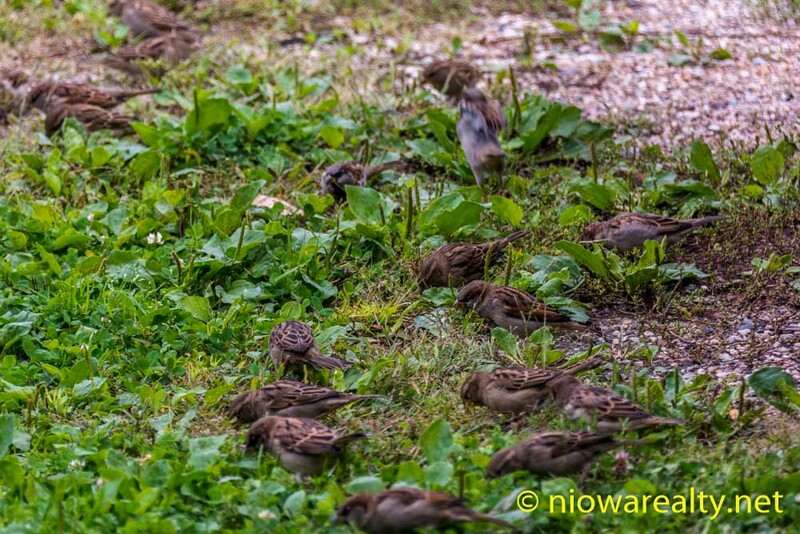 There was a flock of sparrows at the back of my office today and appeared to be feeding on weed and grass seeds. They were so cute! If you look closely, there’s a first in flight.